He was born in Ali Bayramli village of Zagatala region on the 11th of May, 1975. After studying at the Russian sector of the village school till the 8th grade, he continued his education at the Vocational school # 3 in Gakh region and obtained a profession of a machine operator. Later, he worked at “Daghistan” statefarm. Natig was called for military service by the Zagatala region Military Commissariat on the 13th of May, 1993. He first served in Baki and then later had military trainings in Seyfali and which was sent to the front lines. He was actively involved in the battles that were taking places in Aghdam, Fuzuli, and Tartar regions. He was distinguished for his extreme bravery and resourcefulness in the battles. Special Military Unit # 777 was brought to Ganja on the 4th of October, 1994. Chaos was ruling over the city during these not easy times. The soldiers of the Special unit were ready to fight in order to supress the uprising and bring the order. Natig was among those soldiers too. He was killed while standing in defense of the counry. 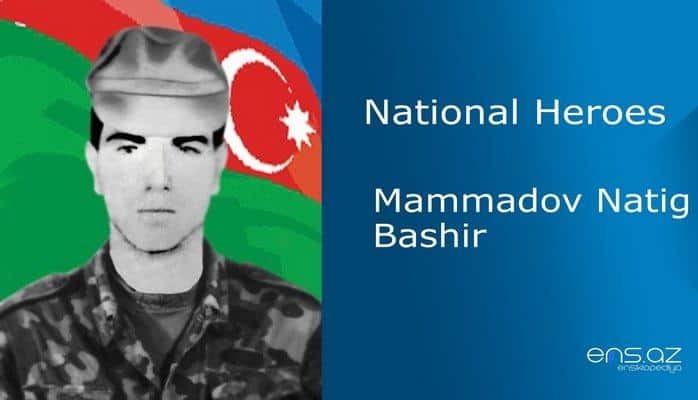 Mammadov Natig Bashir was posthumously awarded the title of the “National Hero of Azerbaijan” by the decree # 215 of the president of Azerbaijani republic on the 5th of October, 1994. He was buried in Ali Bayramli village of Zagatala region. Ali Bayramli village kindergarten is named after the hero.